“Portals” have a long architectural history, especially what we might call unique or specialty construction. Historical buildings, government structures, cathedrals, synagogues, churches, libraries, courthouses, and the like are ready examples that illustrate what we mean. 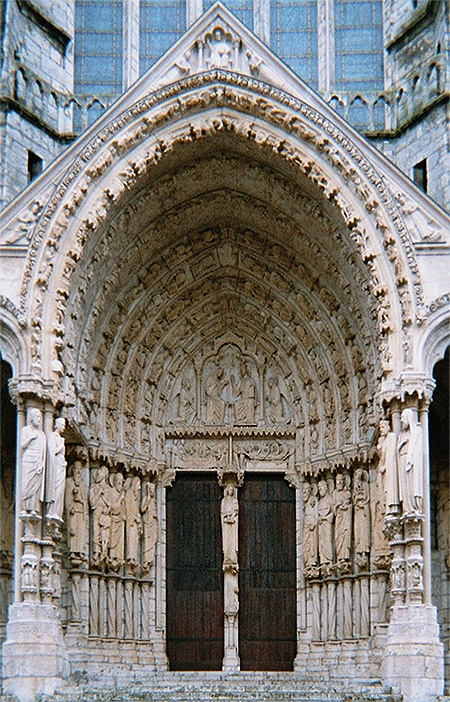 The “entranceway” or “portal” to such edifices is usually designed to decorate and attract the eye and the people. Look at one that has lasted 900 years. Yes, that is NINE HUNDRED YEARS!!! Cathedrals (all denominations) and Catholic churches supply some of the clearest examples of what can be done to dress up otherwise-ordinary ingress/egress to a building. Just about every major city worldwide has one or more example of unique portals as entrances to historic---and now modern---edifices. Well, Metfab Metals is not as old as the Chartres Cathedral (but our roots do go back to Jim’s immigrant grandfather’s tool & die shop opened in 1947). And we hadn’t, until recent years, made so many portal frames as we are now being called upon to make. The steel structure for a one-of-a-kind portal is, to us, just a matter of jealously following the 3-D drawing we can generate now in-house, from your specs, often now with AESS finishes. Our long experience with AESS steel uniquely qualifies Metfab Metals as the kind of classic fabricator that can fulfill your most challenging portal design. This is especially so as Metfab Metals has for decades now made constituent parts daily to very critical tolerances, for billion dollar buildings (and far more humble, but also precise, jobs too). In ALL of these, we seek--and deliver-- 100% compliance with the specs, as given to us, pre-engineered and computer-drawn. And always ON TIME!!! so that YOUR jobs go perfectly smoothly from its earliest stages--------and end as scheduled, on time and successfully! Call us (even at the “Concept Stage” before your job is ready to issue a Purchase Order); you’ll soon see we produce..
New "Portal" Jobs----- As we publish this Newsletter, we are working on novel portals at diverse projects in Brooklyn and Virginia. One is for a commercial development while the second is for a campus building related to the health industry. Watch these Newsletters for future updates on these exciting issues. These are further examples of our spectrum of metal skills. Hudson Yards, NYC, NY----- Four (4) years after we supplied our first parts here, we are still delivering weekly to this megalithic development on the West Side of Manhattan, including a whole spectrum of AESS parts, assemblies and mullions. The architectural centerpiece is “The Shed” future home of a whole spectrum of cultural events and symphonies. We are now hard at work on creative “pans” to hold a stone floor that itself will be utterly unique and a further “signature” of this evolving glass palace of entertainment. San Francisco, CA ----- We are spreading our proverbial wings once again to fashion the highest level of AESS parts/assemblies/frames, as well as many specialty metal anchors and miscellaneous fabrications, for a new structure for an old client that has found the cost of 3000 miles of shipping is really a cost-saver for the on-time performance we supply with our precision work. Follow this as well as the jobs we’ll start soon in Utah and Chicago, in this space in future Metfab Metals Newsletters.